I love coffee! I love good coffee! But I cannot afford Starbucks’ or Scooter’s or Jidders’ Coffee House coffee for two reasons: 1) I live out-of-town and do not go into town every day and 2) while Jidders, a local coffee establishment, has reasonably priced coffee, it would still cost me over $35.00 a week, with tip and that over 52 weeks totals $1800+. I know that I can think of more ways to spend $1800.00 than in someone else making me coffee. 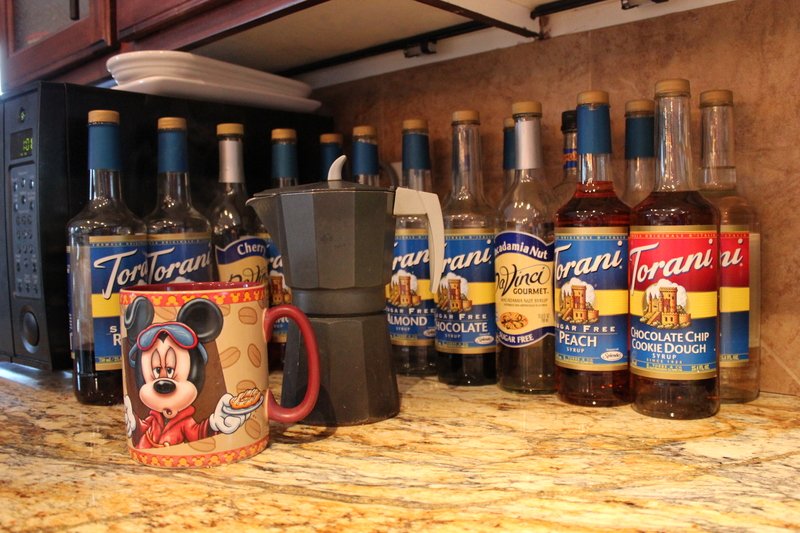 SO….I needed to find a way to create that same coffee, whenever I wanted it, at a reasonable price. Having lived in Spain made the first step to my solution simple. When living in Spain our family adopted the philosophy that we needed to become Spanish and live as the Spanish. While I had purchased an auto-drip coffee maker, I decided that since the Spanish thought American coffee as ‘dirty water’, I needed to invest in a more proper coffee maker. 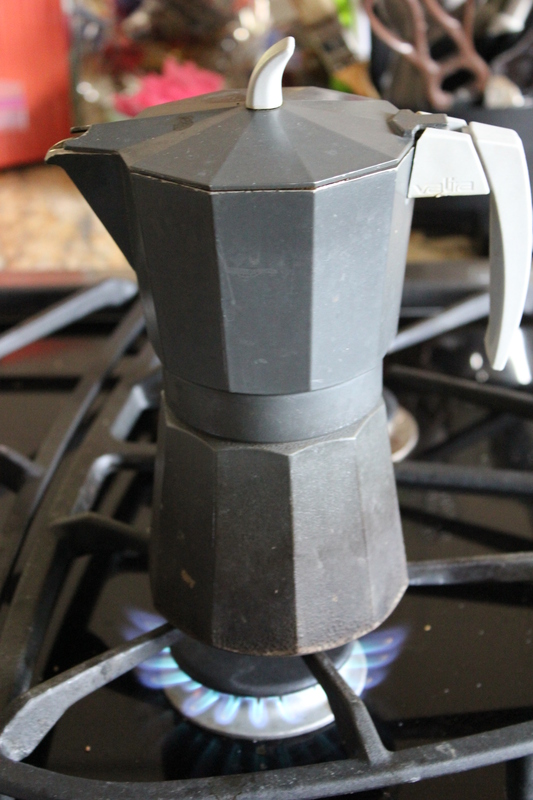 I purchased a stove top espresso maker. In Spain it is just called a coffee maker because they do not categorize their coffee as espresso; you can purchase cafe’con leche, cortado, cafe’ solo or carajillo (coffee with milk, coffee with less milk, coffee with no milk and coffee with brandy). In Spain all coffee is based on what we would call espresso. My 24 oz. coffee mug is unheard of and the largest cup would be 8 oz. 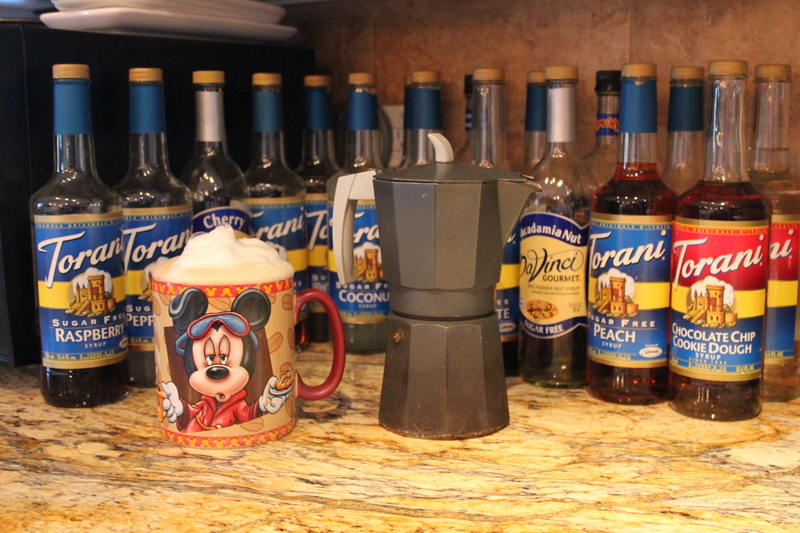 When we moved home I wanted to continue on with my Spanish coffee style. The stove top coffee maker moved home with us and my auto-drip coffee maker was relegated into storage. For years, I would make my coffee, add milk and sugar but still head to the coffee shops for my latte’ fix. Now I had owned an espresso/frother machine in the past but I really liked the stove top method and decided against purchasing a new espresso machine. But I needed a solution to my coffee predicament. As I was walking through a Target Store one day, I saw a hand frother and new that I was on my way to becoming independent. I purchased the frother and then got about to testing the heating of milk to the proper temperature in my microwave. I determined that 2 minutes gave me the proper heat and frothing ability. 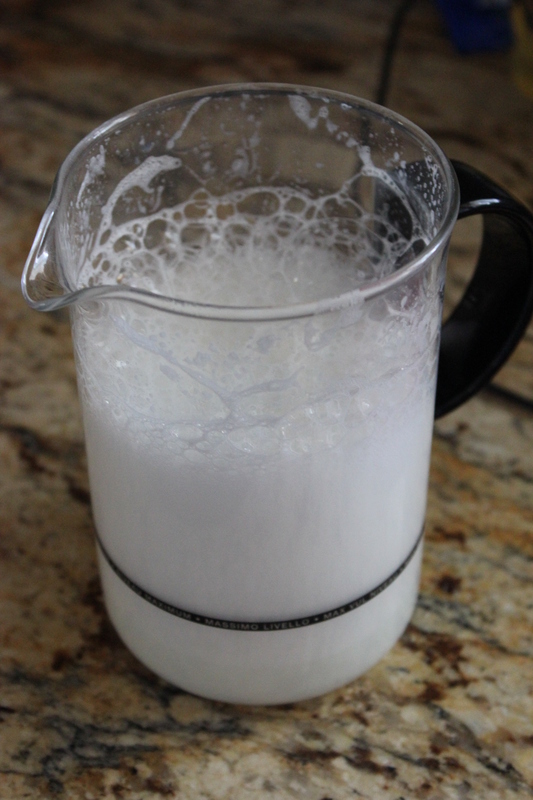 I did discover that freshly opened milk froths better than milk that has been opened for a couple of days. I was disappointed this week when I was reading a magazine and there was a quote about swapping out those unwanted, useless gadgets, ‘like the frother you received from Uncle Fred‘! I love my frother and would not exchange it for the world. It saves me money and helps start my day right. 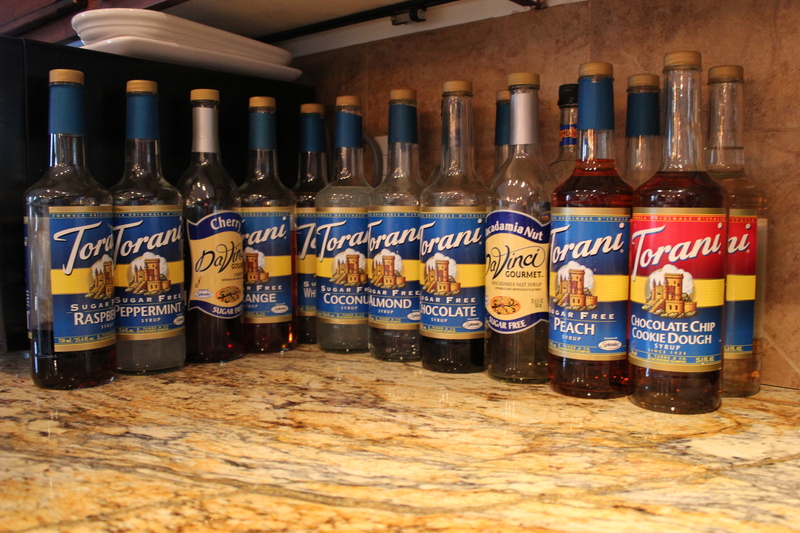 The last step was to find syrups that were sugar-free and reasonably priced. I went to the internet and searched and searched and searched and found http://www.lollicupstore.com. This website has a great variety of sugar-free syrups and when you add in the shipping, it might average out to $8.00 per bottle of syrup (a guess). The bottles range from $4.50-4.85 a bottle. Shipping is expensive, but worth it because of the variety and it is delivered UPS to your door. 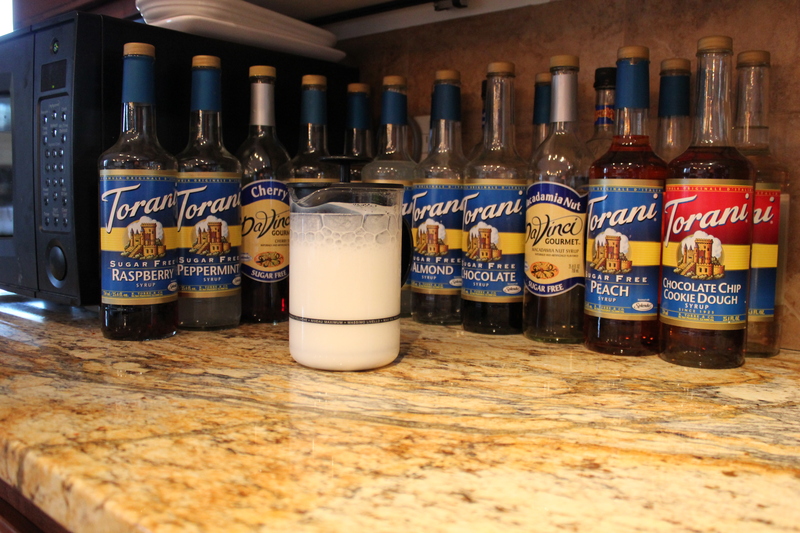 I usually stock up once or twice a year and order 12-15 bottles at a time. It is definitely less expensive than $1800.00 a year and the sugar-free varieties are greater in my home coffee shoppe than any coffee shoppe I have ever visited. I am not a coffee expert but I like good coffee and a great latte’. People who know me, know that I carry my Mickey Mouse Mug where ever I am in the morning. I have approximately 13 oz. of coffee and 8 oz. of frothed milk. My variety ranges from ‘Almond Joy‘ to ‘Bing’ candy bar to caramel pumpkin to Peach Melba. My new discovery is added syrup to the milk prior to frothing. 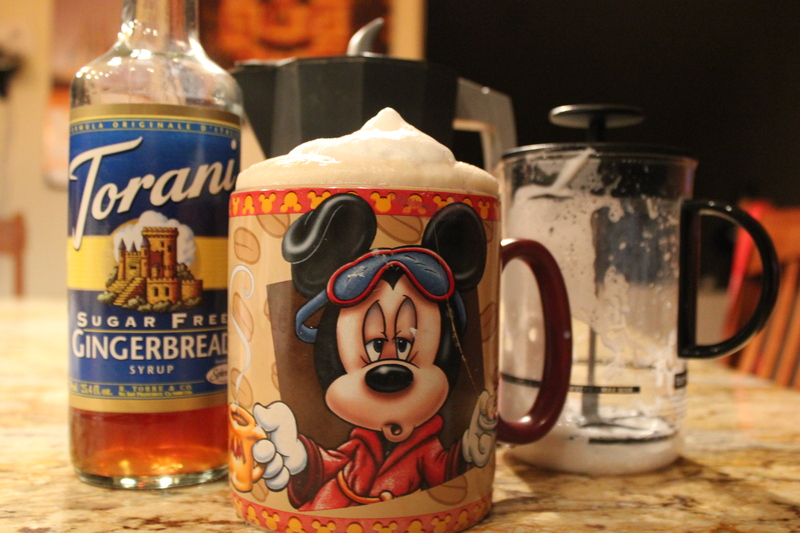 I add sugar-free vanilla syrup. It adds another layer of complexity to the coffee and it reminds me of homemade vanilla ice cream as I sip through the froth to get to the coffee. While this system may not be for everyone, if you like a good coffee but don’t like the expense, I would invest in my system and enjoy what you like, when you want it and not worry about needing to get out of your automobile or sitting in a drive-thru. It definitely works for me and it makes me, not a poor man’s coffee connoisseur but an economical alternative to the expensive coffee shoppes. ENJOY! Today was Caramel Pumpkin Latte’ with Vanilla Bean Froth. I am getting ready to make my second up.